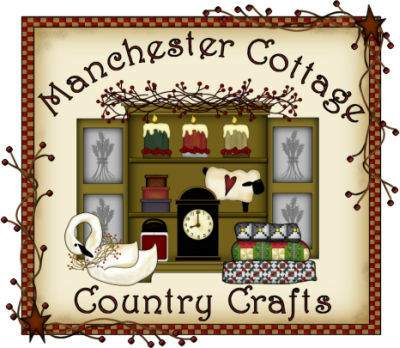 Small signs are a line of original hand painted designs from Manchester Cottage. They are made from 3/4 inch wood, are 5 inches x 5 inches, and are finished with a wire hanger and coordinating fabric strips. They make the perfect gift for many occasions or just a way to say thank you, I miss you, or this reminds me of you. With a wide variety of designs to choose from it makes it easy to find something to meet your needs, and with a price of $5.00 each it also makes it easy on your wallet! Have fun shopping at the Manchester Cottage small sign department! 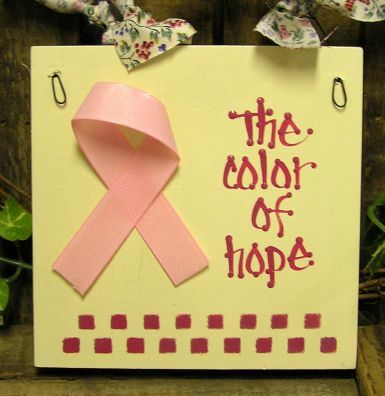 Our pink ribbon sign is dedicated to those who have had breast cancer affect their lives. All proceeds go to Breast Cancer Research. 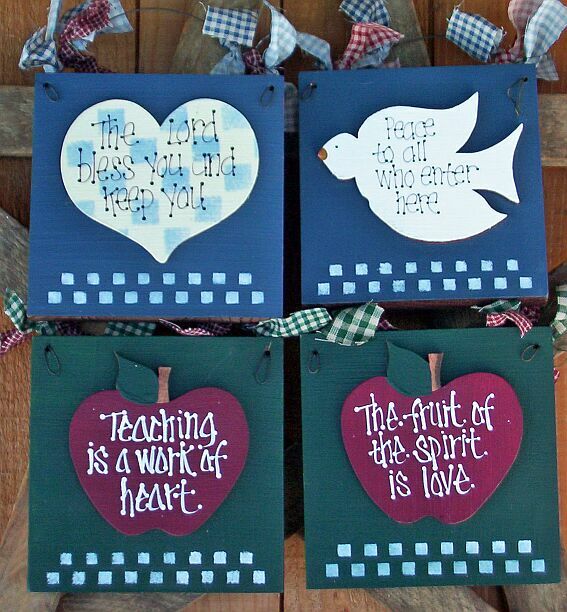 It can be plain or personalized on the ribbon with a special name. 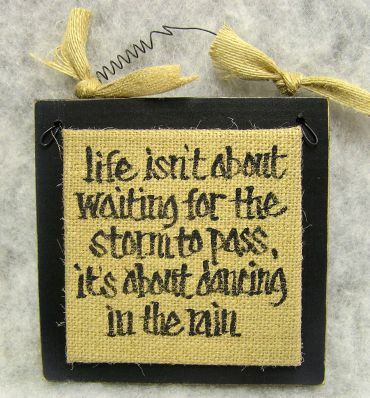 This original design from Manchester Cottage features a hand painted saying on a burlap covered plague that says "life isn't about waiting for the storm to pass, it's about dancing in the rain". 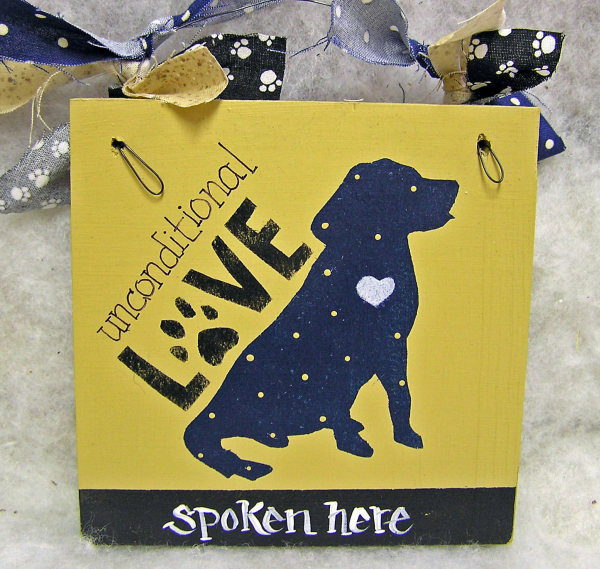 It is mounted on an antique finish black wooden sign with a curled wire hanger and burlap ribbon ties. It measures 5 x 5 x 1. This is an original design hand painted wooden sign. 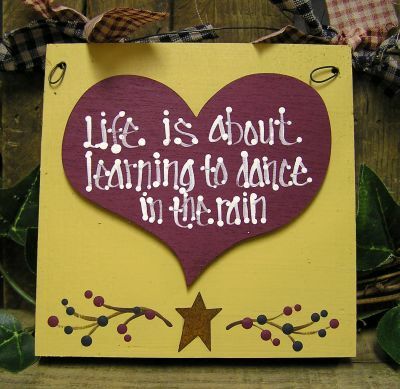 It has a rusty tin star at the bottom with a berry design and a wooden heart that says "Life is about learning to dance in the rain". A wire with fabric strips is the hanger. It measures 5 x 5 x 3/4. This is an original hand painted wooden sign. 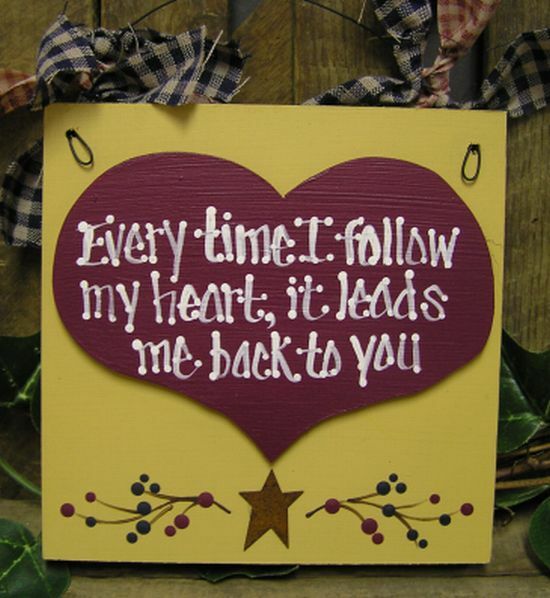 It has a wooden heart that says "Every time I follow my heart it leads me back to you" and a rusty tin star with a berry design across the bottom. A wire with fabric strips forms the hanger. 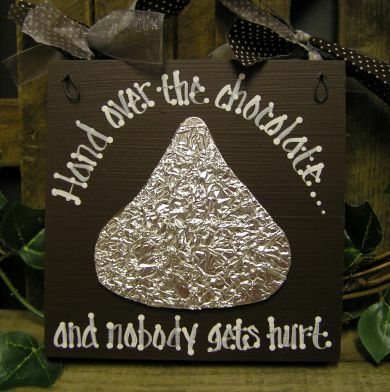 This original hand painted sign comes in 4 styles: "Hand over the chocolate and nobody gets hurt" (shown), "Life, Liberty, and the pursuit of chocolate" (click on photo), "When no one understands, chocolate is there" (click on photo) and "Chocolate...here today...gone today!". It has a foil covered kiss on the front and a wire hanger with fabric ties. 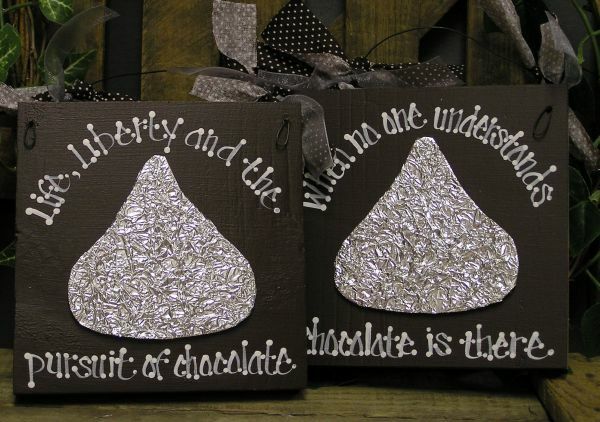 Hand over the chocolate Life, Liberty....chocolate Chocolate is there Here today...gone today! 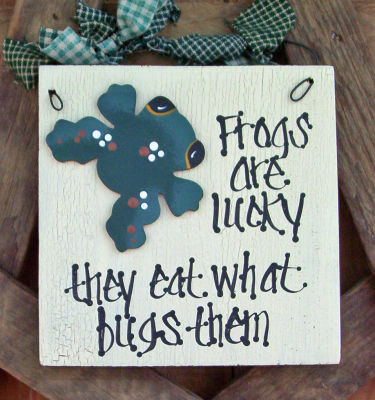 This cute little wooden frog sits beside his message "Frogs are lucky...they eat what bugs them". It is on a cream background. This is an original hand painted design from Manchester Cottage and features a black wooden antique finish sign with a curled wire hanger and burlap ribbon ties. 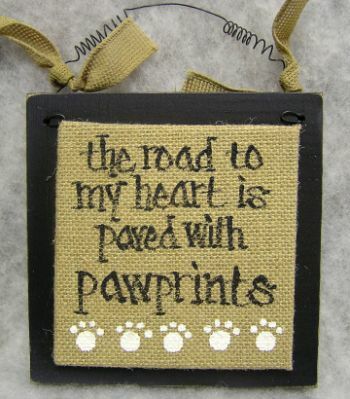 The center is a burlap covered sign that says "the road to my heart is paved with pawprints". It measures 5 x 5 x 1 + hanger. Our cat signs come in nightfall blue and have a hand painted wooden cat on them with a pawprint border across the bottom. They have quite a variety of sayings that you can see by clicking on the "Cat" arrow. They measure 5 x 5 x 3/4 + hanger. 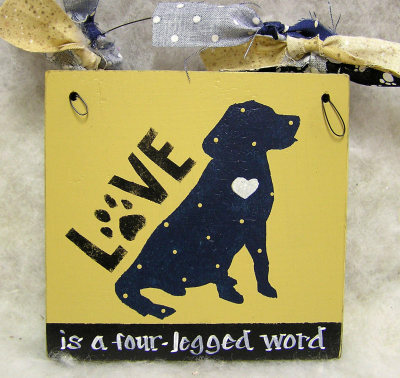 This Manchester Cottage original design wooden sign features a spotted dog and comes in two designs "LOVE is a four legged word" (shown) and "unconditional LOVE spoken here" (click on photo to see this option). It has fabric ties that match the sign and a wire hanger. 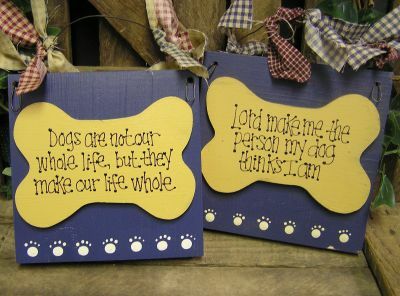 Here are our dog signs in nightfall blue with a wooden bone on them along with a pawprint border across the bottom. 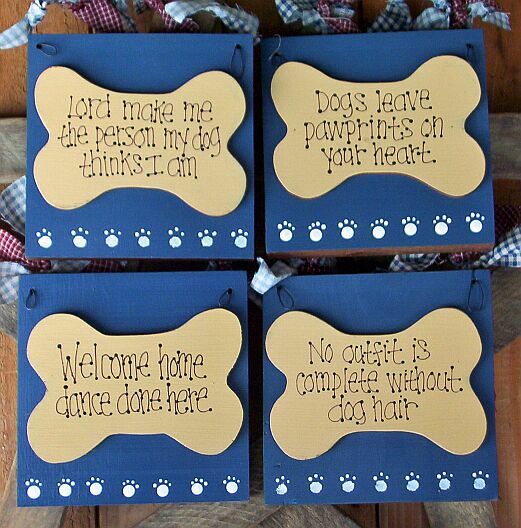 They come in a wide variety of sayings which you can see by clicking on the "Dog" arrow. 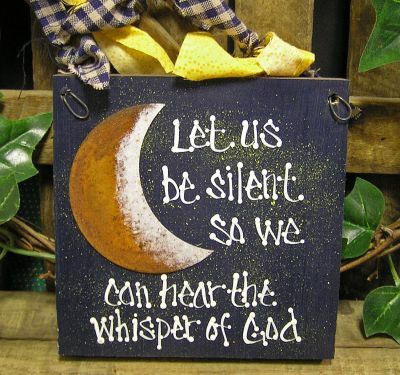 "Let us be silent so we can hear the whisper of God" is the saying featured on this sign. It has white and yellow flyspecking on a midnight blue background along with a rusty tin moon. 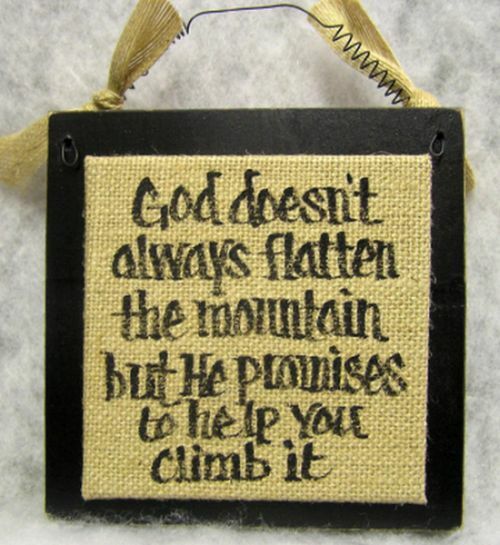 This original hand painted sign has a burlap covered plague in the center that says "God doesn't always flatten the mountain, but He promises to help you climb it". The plaque is mounted on a black antique finish wooded sign with a curled wire hanger and burlap ribbon ties. 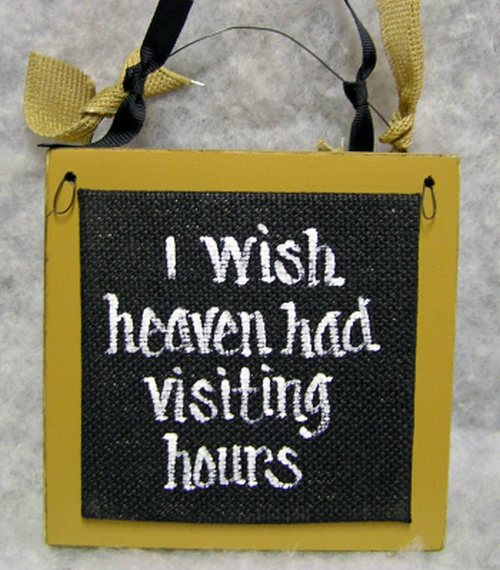 "I wish heaven had visiting hours" is the message on our original designed sign. 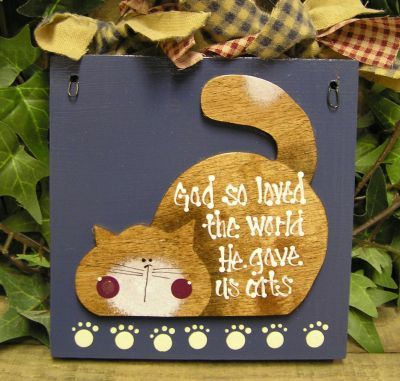 It is hand painted on a burlap covered square, mounted on a wooden sign, and has a wire hanger with burlap and black ribbon ties.